It appears that the NikeLab ACG Lupinek Flyknit will be receiving a bit of a makeover for the summer with this upcoming Nike ACG Flyknit Lupenik Low version. The original high-top of the silhouette debuted during the holidays of 2015, and this low-top edition is expected to heat up the summer. 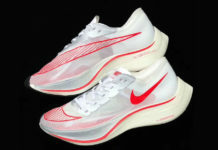 The shoe features a similar color scheme as the original silhouette that features a Black and White Nike Flyknit constructed upper that overlays a White base. Check out the first look at the Nike ACG Lupinek Flyknit Low below and as of right now there isn’t an exact release date, but you should be able to find these hit select NikeLab locations later this summer.